Tidy up your facial hair with this all-American comb. Each is laser-cut and hand-finished from Kentucky steel and Ohio titanium and Made for a Lifetime. Have it engraved with a custom monogram for a personal touch and pass it down for generations. Dimensions: 4" x 1.25" x 0.1"
This comb has a great feel to it, you get a sense it will be something you keep for a lifetime. Definitely worth a price higher than other combs. Love it! But too expensive! To call this laser cut, hand-finished, Made for a Lifetime comb a "metal comb" is like calling a Ferrari a car. Founders and childhood buddies John and Tedd started Chicago Comb Co. to make everyday objects that were more than everyday–they create enduring works of sculpture and design right here in the USA. 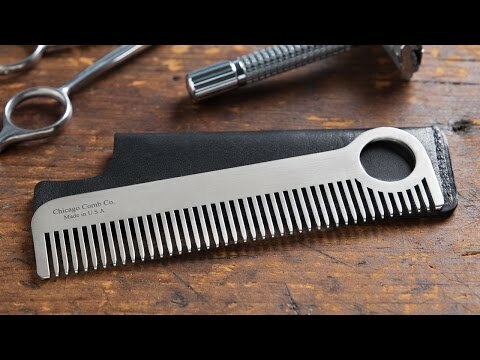 Blending artisan manufacturing methods and the latest technology, each comb is precisely cut from Kentucky stainless steel and Ohio titanium to stand up to daily use. John and Tedd also wanted to kickstart some local manufacturing in their native Chicago area and to make a product that could be treasured across generations. To make your comb even more memorable—or if you’re gifting it—you can add a custom engraved monogram. Chicago Comb also helps you protect each comb in style. Their Horween leather sheaths are a gorgeous, custom fit addition. Each is vegetable-tanned and hand-oiled in Chicago at a 100-year-old family leather tannery. The full-grain leather ages well, to match the long life of your comb. Whether taming wild bedhead or straightening up a ‘stache, Chicago Combs are a lifetime styling companion for any man.